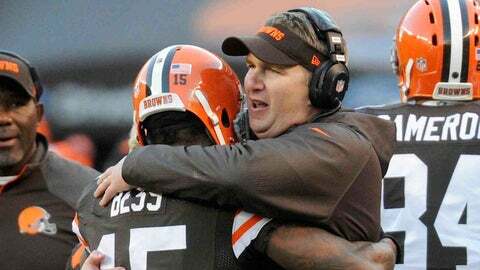 Cleveland, OH, USA; Cleveland Browns head coach Rob Chudzinski hugs wide receiver Davone Bess (15) after Bess caught a touchdown against the Baltimore Ravens during the first quarter at FirstEnergy Stadium. CLEVELAND (AP) — Davone Bess had a disappointing and shortened first season with the Browns. The wide receiver was placed on the reserve/non-football illness list Saturday, ending his season with two games left and after he missed practice time this week for "personal reasons." The Browns announced the move with Bess after traveling to New York to play the Jets on Sunday. The team gave no further details for Bess’ absence or his abrupt end to his season. The 28-year-old Bess was excused from practice on Thursday and Friday by Browns coach Rob Chudzinski, who said Josh Cooper and Greg Little would likely get most of the snaps at slot receiver, Bess’ primary position. Bess will also miss the season finale at Pittsburgh. The Browns acquired Bess in a draft-day trade from Miami in April, and Cleveland quickly signed the six-year veteran to a three-year, $11.5 million contract extension through 2016. The Browns coveted a sure-handed receiver and expected Bess would be both a playmaker and leader. However, he leads the NFL with 14 drops while catching 42 passes for 362 yards and two touchdowns. In a loss at Kansas City, Bess dropped three passes and also muffed a late punt, costing the Browns any chance of upsetting the Chiefs. On Friday, a photo on Bess’ Instagram account showed him sitting on an outdoor deck and lighting what appears to be a cigarette of some kind. He has a flag draped around his neck and nearby is a photo of late reggae legend Bob Marley. The photo has since been deleted, and the Browns had no comment about it. A native of Oakland, Calif., Bess had 61 catches for 778 yards and one TD last season for the Dolphins, who originally signed him as an undrafted free agent in 2008. Bess played college ball at Hawaii.